During earnings calls among the major networks last week, there was a consistent refrain: a la carte may be in the news, but it's not on the horizon. Most CEOs simply took questions about a la carte the same way they take all dumb questions: as invitations to discuss their networks' innate superiority to the competition. "My favorite part about Piper is the variety of things I've been able to do with her. I loved that Michael Jackson dance, but I also loved the last scene of the last episode. I love all of the stuff I was able to do with [girlfriend] Alex and Larry. I love the extremes." As cable siphons off GRPs like a fat kid sucking YooHoo through a Krazy Straw, broadcasters have countered with manic fits of development. "Social media has been such a great tool for my fans and me to keep in touch with each other. I use Twitter the most, but I've also started to use Keek, which I love because I'm able to post short videos. I just posted a video from my 21st birthday in Africa, which was amazing." Just as in the cosmological model that explains how the universe sprang into existence from an infinitely dense singularity, CBS' The Big Bang Theory has grown with such explosive force that it appears to be its own ever-expanding universe. Because he is the president of the network and because Jon Hamm has momentarily stepped out to take a call while a photographer adjusts the lighting, Charlie Collier is allowing himself a quick peek at the contents of Don Draper's desk. Showrunner David X. Cohen has seen his and creator Matt Groening's series Futurama through seven seasons—and 14 years of cancelations, syndicated success, direct-to-DVD resurrection, provisional renewal and, finally, a new lease on life at Comedy Central. That lease expires this summer, after the show's eighth and (most recent) final season. When Adweek caught up with Cohen, he suggested we make a chat about Futurama an annual tradition "because there's always a cancelation to report on." "In San Diego, where I go every year to Comic-Con, there was a restaurant where if you can eat a 12-egg omelet and biscuits and fruit bowl and all this stuff, you'd get it for free. I tried and failed miserably. The waitress even told me, don't do this. That became an episode, and we won an Emmy for it." 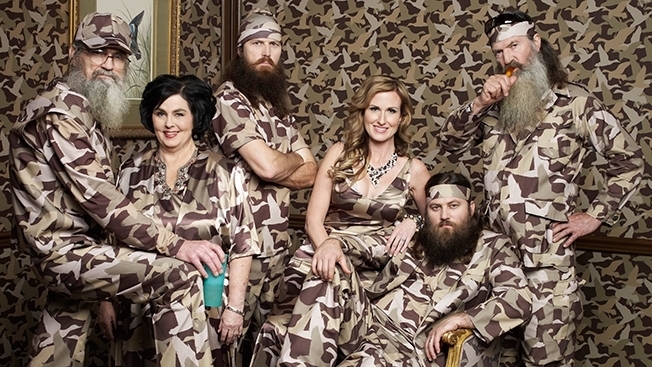 A&E's Duck Dynasty is more addictive than quack. Season 4 of the wildly popular unscripted series premiered to record ratings Wednesday night, delivering 11.8 million viewers, of which 6.26 million were members of the target demo (adults 25-54).